Rinse scallops or shrimp, then pat dry with paper towels. If using scallops, peel off the opaque muscle or “foot” on each one if it is there. In a 10-inch skillet, melt butter in canola oil over medium-high until foam subsides and oil starts to ripple. Add scallops and let cook until golden brown on one side then turn with tongs and let cook on the other side, about 3 minutes total. If using shrimp, stir them for one minute until they are just starting to turn pink. Transfer seafood to a plate and set aside. Add shallot to pan and sauté until fragrant, about 1 minute. Pour in broth and let liquid come to a boil; stir in peas. Stir in lemon juice and tarragon. Return scallops or shrimp to pan and let liquid come to a boil again then reduce heat and simmer until scallops or shrimp are opaque through, 2 to 3 minutes. 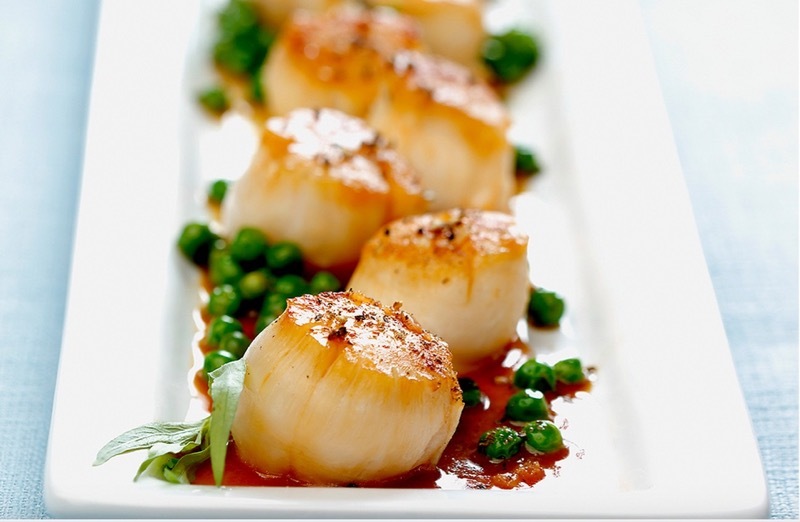 Divide scallops or shrimp among plates and top evenly with peas and sauce. Season to taste with salt and pepper and serve.